2 Houston Street corner of Shields Road, Kinning Park, Glasgow. This old photograph was taken around 1860s. Houston Street, Kinning Park ran from Shields Road to Crookston Street. In this short distance Houston Street was well served for in terms of drinking dens and had a total of 8 public houses and 2 licensed grocers businesses. 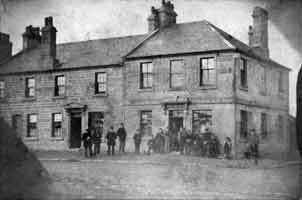 James Jack's premises was established circa 1860, he lived with his wife Elizabeth in nearby Shields Road before moving to the flat above their shop. Mr Jack was assisted with his wife and family in the business which started out as a licensed grocers before it was operated as a full retail concern. James Jack was now a well known and respected general grocer and a wine & Spirit merchant in the area. In 1880 Mr Jack passed away at an early age, at which time his wife Elizabeth had no alternative to run the business as she had a family to look after. Her two daughters Elizabeth and Annie helped her in the running of this popular public house. Possibly one of the reasons the business was sold on was the fact that there was no male member of the family to take over the business, which was sold a few years later after nearly thirty years in the family. The next licensee was a gentleman called Joseph Foy, he also lived above the premises and ran another public house at 28 Reid Street, Bridgeton in the east end of the city. Less than ten years trading here, he sold the business to John MacPhee, grocer and wine merchant. Again he lived in the accomodation provided above the pub. It seems that business was not that good at the end of the 1890s as after a few years the business changed hands several times. John MacPhee took over around 1893, by 1897 William Chapman was now the licensee. Mr Chapman had the idea of renting the upstairs flats to increase his annul income. In 1897 Patrick O'Malley a Stevedor was renting one flat while Mrs William Lindsay and Gavin Lindsay were renting another. Again in 1899 the business was sold on, this time to Mr George Adams, he paid an annul rent of £29 10 shillings and lived in nearby Shields Road. The last licensee was John McTaggart who ran the premises from 1905 until 1917. After the First Wolrd War a gentleman called George Anderson was trading here, however he was a Draper not a licensee, so the history of this old licensed premises ends here. Other pubs on Houston Street. 1899. 1 Houston Street was owned by John Urquart. 41 Houston Street owned by John Thomson. 45-47 Houston Street corner of Watt Street was oned by Thomas McGuire. 81 Houston Street corner of Pollok Street oned by Samuel M Burnside, he also ran a pub on 680 Rutherglen Road at the corner of Logan Street. 115 Houston Street corner of Kinning Park Street owned by James Miller, he also had premises at Norfolk Street at the corner of Nicholson Street, the pub was called the Gladstone, do you remember it as the Norfolk Arms? he also had the Eglinton Vaults as it was then known at the corner of Surray Lane and Eglinton Street. 142 Houston Street corner of Ardgowan Street was owned by William Wingate. 170 Houston Street corner of Crookston Street was oned by a lady called Agnus S Craig.